The first things that come to mind when you think of Abu Dhabi may be luxury hotel complexes and air conditioned mega shopping malls, and while these are definitely part of the experience, there is much more to this fascinating city. From desert camping trips to camel racing, the grand mosque to the traditional fish market, we have compiled a list of some of the more unusual and exciting top 10 things to do in Abu Dhabi - the capital of the United Arab Emirates. The camel racing season runs from October until March, and these fiercely-contested races have long been a part of traditional Bedouin life. It’s a serious business in Abu Dhabi, with racing tracks found all over the Emirate. Some of the best races are run at the Al Wathba racetrack on Thursdays and Fridays. It is 45 kilometres east of the city, with races free to watch — an unmissable experience. Head out of the city to Al Ain, a stop on trade routes across Arabia for thousands of years and the region’s largest oasis town. Explore the atmospheric fort and camel market before continuing to Jebel Hafeet, the highest peak in the Emirate, to drive the 7.3-mile road, climbing some 1,200 metres and winding round some 60 corners. The road has an incredibly smooth surface and is billed as the world’s best driving roads. It certainly has some wonderful views on the way. 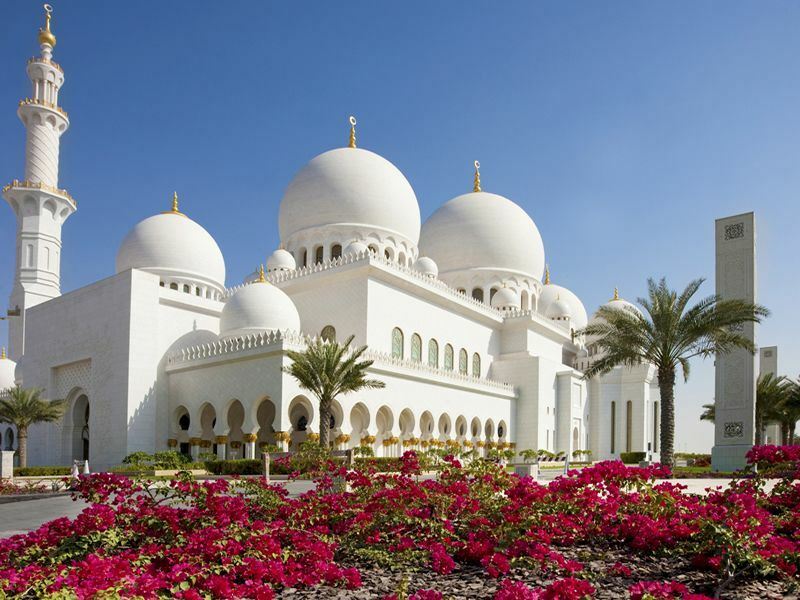 Sheikh Zayed Mosque, named after the founder and first president of the UAE, is one of the world’s largest mosques. With 82 domes and four minarets the mosque cost two billion Dirhams (about $545 million) to build. It is the only mosque in the UAE open to non-Muslims, and a guided tour will take you around this huge complex, which has room for 40,000 worshippers. The prayer hall alone holds around 9,000 people and the mosque also has the world’s largest carpet, a 5,000 square metre artwork hand-made by more than 200 artisans. The saluki gazelle hound is reckoned to be the first domesticated dog, closely related to the wolf, and used for hunting by Bedouin for millennia. These highly-prized hounds are known for their exceptional intelligence, loyalty and stamina but the traditional desert lifestyle that called for them is changing fast. The Saluki Center was established in 2001 to help preserve the breed, and a visit lets you come face to face with these beautiful, graceful, yet powerful dogs. Cruise gently along the Abu Dhabi Corniche by wooden sailing dhow or swanky modern motor cruiser to take in spectacular views of the city’s skyline as night falls. Enjoy traditional music and a buffet of local delicacies for a magical evening. Spend the evening at the exclusive Abu Dhabi Golf and Equestrian Club for a night at the races. Take in all the action from a patio in front of the starting boxes and feast on a sumptuous barbeque as the races unfold. Set out from the city in a 4WD vehicle into the desert, setting up camp among the vast dunes and enjoying a Bedouin feast under a canopy of stars. Lounge on plush cushions, sip an Arabic coffee after dinner and maybe try an authentic shisha waterpipe to round off the evening. Rise with the sun and continue your adventure in the desert, perhaps trying a spot of sand boarding on the way. Abu Dhabi has transformed from a small fishing village before oil was discovered in the 1958, into the dynamic city of 850,000 inhabitants it is today. The city blends high-tech modern design with traditional Arabian culture, and an architect’s tour will introduce you to both the glittering glass and steel skyline and the more traditional architecture found in the Emirate. See modern masterpieces like the national museum, the maritime museum and the performing arts center and learn about some of the most exciting architectural projects in the world. Head to Abu Dhabi's Dhow Wharf and Fish Market to watch fishermen unload their catch, as boats come in day and night. Soak up the atmosphere as market traders, fishermen and supper bustle around this traditional market, where you can get a real feel of the old Abu Dhabi. Buy a fish straight from the dhows, get it cleaned and have it charcoal grilled before your eyes for the freshest fish supper you’ve ever had.